There aren’t many rules one needs to learn before visiting the Pieropan family, but try not to introduce yourself as Giulio. 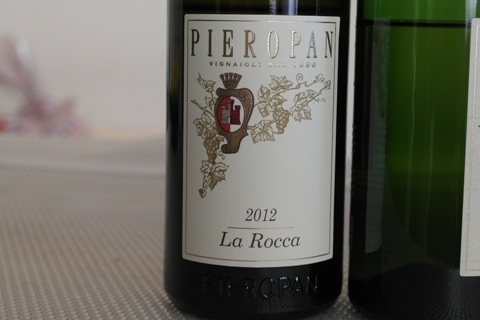 Having been in the business of making wines using fruits harvested from the hill of Soave since the late 19th century, the Pieropan family went through several tough rides to be what it is today. Although he was trained as a surgeon, Leonildo Pieropan only came to realise he had haemophobia on his first surgery. His fear made him quit a solo career that involved blood to one that involved wines with his family. It was the 1890s, and with only two hectares of land in Calvarino for the production of the sweet Recioto di Soave, the brand was born. Tales of the second generation of Pieropan revolved around two names, Fausto and Gustavo, who were said to work the farm till it was taken over by the second Leonildo of the third generation. But apart from Fausto and Gustavo, there was a third son whose name is barely mentioned in the Pieropan history, Giulio. And he wasn’t fondly remembered. When Giulio died, his will had the portion of the family property he owned donated to the church. Finding it a hindrance to work in a property that was partly owned, the family was not happy. To this day, the name Giulio invoked unhappy memories and Andrea, the fourth generation, was prohibited to name any of his sons Giulio. A sign on how grave Giulio’s final action was. A wine that bears the name of the town, Soave was once the most exported white wine of Italy. Market demand in the 1970s encouraged opportunists to leverage on this trend, and many farmers attempted to grasp this opportunity by planting Garganega grapes on the flat terrain around the Soave hillside when the hilly terrain had ran out of real estate. But this action proved to be futile, if not destructive. 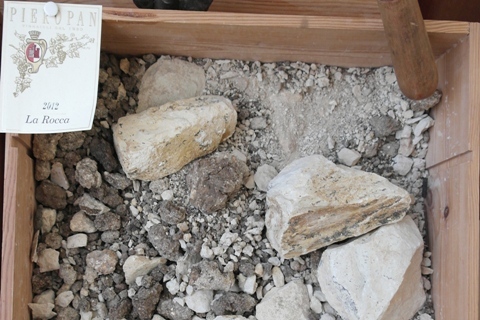 It wasn’t long before Soave was not suave as the flat terrain wines, which could not give the same characteristics that were desired from the hillside vineyards, tainted the reputation. Soave fell from grace and Pinot Grigio replaced, and still is, the most exported white wine of Italy today. In 1978, Leonildo Pieropan of the third generation bottled the first wine of La Rocca, a product from limestone rich soil with high level of marine fossil deposit and potassium. Generous and rounded, this was a first for Soave. A wine that drew attention from around the world, and put on par against some of the finest white wines in the world. But it was quiet within the borders of Italy. Italians, with their ever traditional preferences, were not buying the yellowish gold Soave. Never one who likes to draw comparison with other producers, Leonildo stood his ground and continued his work diligently. It took almost a decade, in the late 1980s, before the diversity of Soave was recognised and La Rocca accepted as an unique expression coming from Soave Classico. Ironically this wine, by today’s standard, can do just as well without the association. After more than a century since its founding, today’s Pieropan holds 35 hectares in Soave Classico and 15 hectares in Valpolicella, a venture it entered in 1999. But the culture of the family is an interesting one, to preserve traditional identity through modernisation. In 2008, the Pieropan family went against the regulations and decided to use screw cap closure for the Soave Classico bottles to preserve freshness of the wine. But there was a price to pay and that was the bottles kept under caps were not allowed to have the Soave Classico title. These laws were finally relaxed in 2013, under certain ambiguous terms. Clearly, the Pieropan had been in the frontier when it comes to Soave. But one winery can do little to change the reputation of the entire area. Andrea Pieropan, while guiding us around the winery, pointed out few key issues in Soave. 95 per cent of Soave production comes from a single business entity, which with its disproportionate ownership, resulted in mediocre wines and unsustainable pricing model to appear. Comparing to Barolo in Piedmont, the higher proportion of Barolo market shares belonging to private wineries had yield considerably outstanding wines that can differentiate and offer diversity in the market. Secondly, the ambiguity and leeway provided in the wine laws had allowed blending of non indigenous grapes in most places. A style that Andrea believes will only homogenise the wines of the world, which in the long run, will certainly confuse people on what a region should taste like. From my point, if you don’t use the indigenous variety you will never have an expression of the area. We have also to be honest. We play the game of indigenous grapes then we also have to recognise they can be different. While much has changed in the world of Soave, much more remains to be done. Don’t just give up on Soave yet, the Classico is a class of its own.